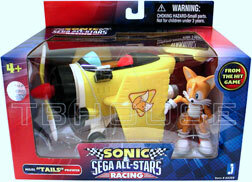 This page has the "Line 2" of the Sega All-Stars Racing figures & vehicles. Although all of the racers appear in the game together, they weren't all released simultaneously. By the time the 2nd line is finished releasing, all the racers from the game should be present. This second wave started in August 2010. These lines (mini racer & figure and vehicle) are NOT Toys R Us exclusives, so do look for them in specialty stores (ie, hot topic, Suncoast, GAME, etc) and online. Toys R Us will still be quite a reliable (and non-marked up) source for the figures though, so keep them, and their website in mind. 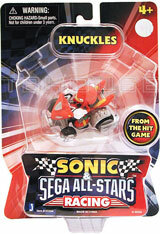 The Knuckles mini racer will also get made, despite not being in a pack. Just because it's mini-size, doesn't mean it lacks in detail! 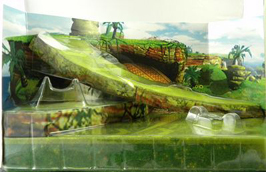 Here's mini eggman in his off-road egg pod / egg-o-matic. He's nicely detailed, and so is the vehicle. You can see the springs/shocks, textured monster truck style/off-road tires, gun, and even the Eggman logo / face decal he's got on the back. Photographed & owned by Taaron. 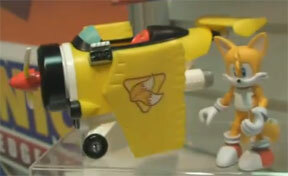 Mini Tails in his airplane / car vehicle also looks great. 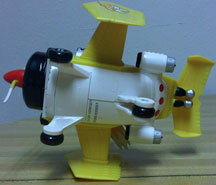 The propeller doesn't spin (its fused to the front) but he can still roll on the 3 small wheels. 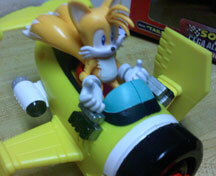 The tiny Tails figure is nicely detailed, and posed convincingly inside the vehicle. The 2-tail symbol looks great on the 'wing' ends, and it does appear on both sides. 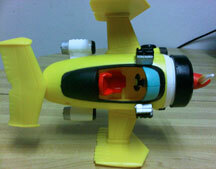 You can't see it in the photo but the front (around the propeller) is also textured with detail. Photographed & owned by Taaron. 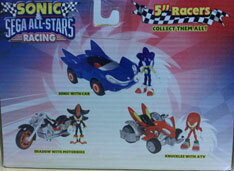 It should also be noted that many non-Sonic characters appeared in "Sega All Stars Racing". The game wasn't totally dedicated to Sonic only, so you expect to see tons of characters in it. 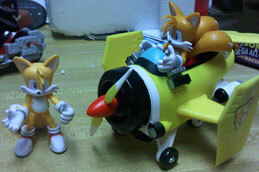 However, for some reason, Jazwares decided to produce a somewhat random selection of non-Sonic people, and throw them in on the line under "Sonic & Sega All Stars Racing"
Here's 3.5 inch scale Tails & his Tornado inspired airplane like racer. It's nicely detailed with the 'Tails' logos on the sides of the wings, colored propeller tips and various ridges & textures. It's a 3-wheel vehicle (unlike the rest) & has very tiny wheels. From the interior shot (Below) you can see that the steering wheel/yoke is very small. 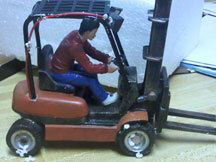 It's nearly to scale with the vehicle, but the figure's hands are too large to grip it. 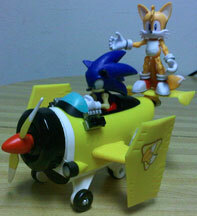 As you can see here, other figures can ride in Tails' vehicle. At left, you can see the first edition single-card Tails fitting easily into the plane. 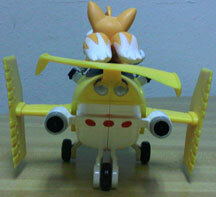 At right, Sonic is shown fitting right inside while Tails stands on the back fin. 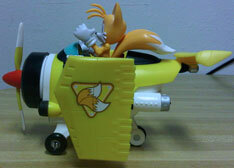 Tails is a difficult figure to 'make' ride in vehicles because his tails are so large they get in the way. 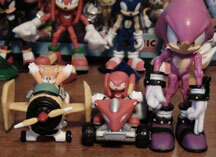 Huge-footed figures (like all Sonic characters) also have design problems for vehicles. 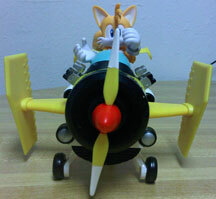 You may notice the Tails figure you get with the plane is a bit different. 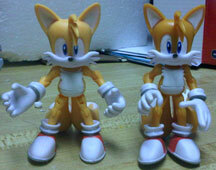 He's lighter yellow (apparent at left) and has the tails sculpted straighter, likely to look like blowing in the wind, or to help him fit into his racer better. However, this re-sculpt doesn't particularly help. His hands are also curled, to grip the wheel, but it is far too small for any figure to grasp. is technically a part of the figure collection. Since he's limited edition, he'll be by far the rare-est figure, if you're trying to collect them all. 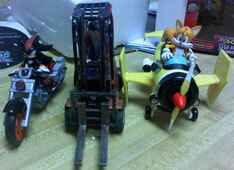 Instead of Jazwares producing him, Symbiote Studios made the figure & fork-lift. 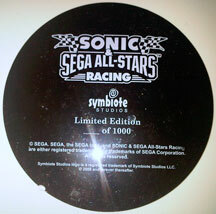 The black disk is a plastic base that has the copyrights & logo. You can see it was supposed to be hand numbered, but no one ever did. His box is plain, black & cardboard. Despite the figure being in a cut-out styrofoam within, it arrived broken (back guard of lift). The faux-metallic paint job is quite good, however the figure isn't a great likeness of Ryo. 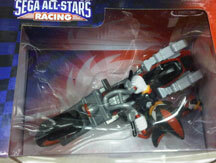 Notice something DIFFERENT about these figures with vehicles racers? 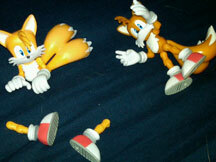 Knuckles (right) demonstrates how you can tell new racers from old ones. 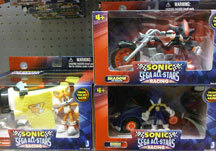 When this line was re-stocked, Jazwares used sturdier plastic for the figures. 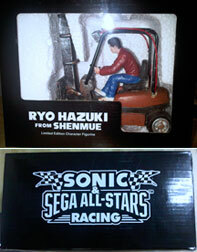 (that improved plastic) and they also packaged the figures standing beside, rather than in/on the vehicles. This is likely to reduce breaking in shipping.